Nitro Pro 7 is designed to include more powerful tools while being easier to use than previous versions. Features are grouped into task-based tabs, enabling you to quickly start working with your PDF file and spend less time looking for the tool you need. The File menu groups common controls to open, save, print, optimize, and send a PDF file. The Quick Access Toolbar is your customizable area for controls you use most frequently, making them available at all times even as you switch between different Ribbon tabs. For more information, see The Quick Access Toolbar. The Nitro Pro 7 Ribbon is designed to be intuitive to anyone familiar with Microsoft Office 2010 software, and provides sets of tools grouped into tabs based on the task they perform. for example, if you wish to add comments and notes to a PDF, on the Home tab, in the Tools panel, select Add Note or Markup Text. For more information, see Add or edit notes, Annotate with text mark-up tools, and Minimize the Ribbon. The Find bar provides a quick way to search for keywords or phrases inside your PDF file. You can also restrict the results to be case-sensitive or whole words only. for more information, see Search and find text. The Information bar appears automatically to inform you when special features of a PDF file need your attention. For example, if a document is encrypted, or contains interactive form fields, the Information bar lets you know as soon as you open the file. All PDF file viewing and editing is done in the Document Pane, which lets you work with multiple documents by using a system of tabs (as commonly seen in web browsers), which can also be organized into horizontal or vertical tab groups. For more information, see: Multiple documents in parallel view. 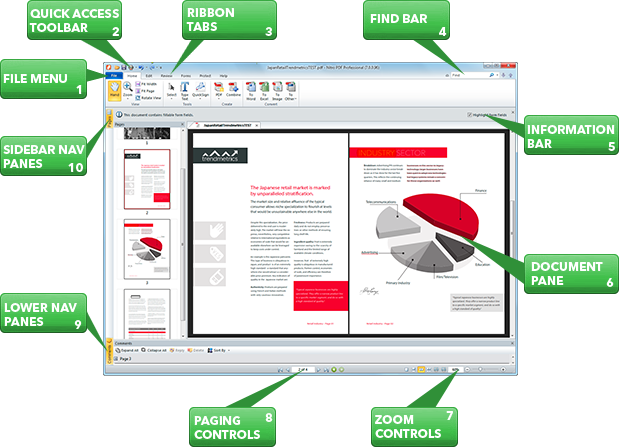 Quickly change the zoom level of the PDF file to enlarge or reduce the size of the page view. You can control the zoom level by adjusting the slider, or by entering a percentage value up to 6400%. Page View controls let you specify how many pages are shown on screen. For more information, see Adjust the zoom level and Change the page view. Use these buttons to scroll through pages of your PDF file, jump to the beginning or end of a document, or retrace your steps forward and backwards through your viewing history. For more information, see View and navigate a PDF file. For more information, see Comments Pane, Attachments Pane, and Output Pane. For more information, see Navigation Panes, The Layers Pane, and Redaction.